Jomini and Boegehold. The details of the test are covered in IS : 3848 – 1981 and ASTM A 255.
in the end quench test Apparatus and immediately end quenched by a jet of room temp. water. The most commonly used method for determining hardenability is the quench test developed by Jomini & Boegehold. 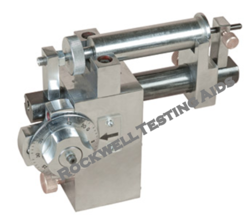 The details of the test are covered in IS : 3848-1981 and ASTM A255.